What’s a piadina? A thin, almost pita-like Italian flatbread dough which doesn’t rise and can cook quickly on a grill or griddle. From our travels throughout Italy I’ve noticed these types of sandwiches are pretty popular in small cafes and places where people are on-the-go like, train stations. Piadina (piadine?) can be filled with a variety of sandwich-type ingredients but the most popular one is the classic ham and cheese, prosciutto e formaggio. The first time I ever had a piadina was in Washington DC. Around the corner from my office building was place called Bread Line, and as you can guess they made some really awesome bread (before ‘artisanal’ bread was popular). They also served piadina at lunch. Some, like their lamb piadina and their sausage piadina were specials and only served on certain days. 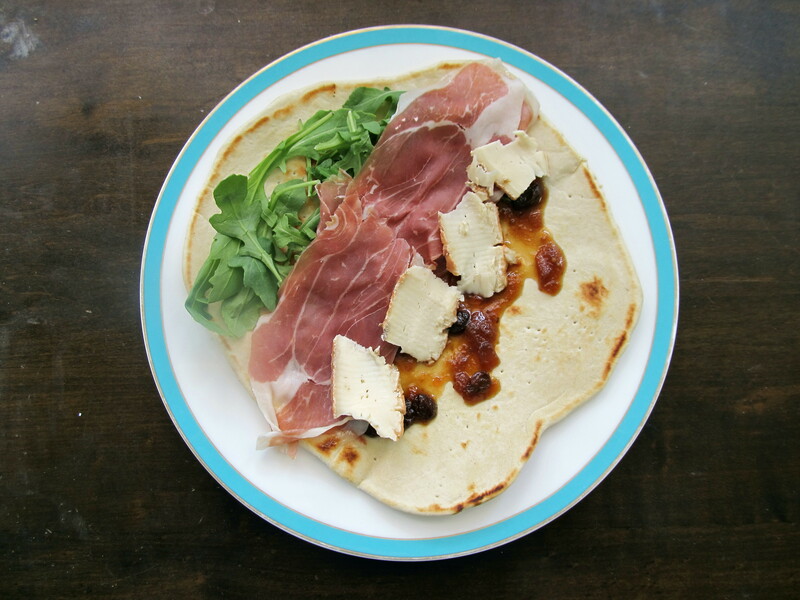 But the one you could get every day was a prosciutto piadina which, if memory serves me correctly, was dressed with some arugula and fig jam. For such few ingredients it was quite a delicious lunch. Probably one of my first real experiences of how good food needn’t be complex. If you have great ingredients, keeping it simple is best. Fast forward to today. I was once again leafing through Classico e Moderno I saw a recipe for piadine dough. Now I like fresh bread but I’ve never made a flat bread before nor did I know what went into it so I was pretty excited to see it really doesn’t take much to make it. However, there has to be typo in the cookbook because the amount of liquid given was barely enough to wet the flour. I thought just a ¼ C of liquid looked awfully suspect for 3 ½ C of flour. My suspicions proved correct. Anyway, the dough came together in a snap once I figured out via the internet the proper amount of water to add and re-did it. Once made you just need to let it rest for a half hour before using. This ease makes a piadina a fantastic idea for weekend lunches. You don’t have to do ham and cheese either. Get creative and make up your own. Combine the flour, baking soda, and salt together and mix well. Add the lard and mix it in with your fingers, squeezing it into smaller pieces until well incorporated. So far it’s like making a pie dough. Stir in the water and mix well. Knead for about 5 mins using the dough hook on a low setting, remove from bowl and finish kneading by hand for a couple of minutes until the dough is a smooth elastic ball. Put dough into a bowl and place in the fridge for 30 minutes. On a floured board/counter flatten out a ball of dough. Using a rolling pin roll out the dough very thinly, to at least an 1/8 inch. Repeat as needed. Heat up a griddle on the stove-top. The griddle is hot enough when a bead of water dances on it. Prick the piadina all over with a fork so air can escape. Place the piadina onto the griddle and cook for a couple of minutes until it browns nicely. Flip over and cook the other side. When cooked, remove from griddle and make your sandwich. 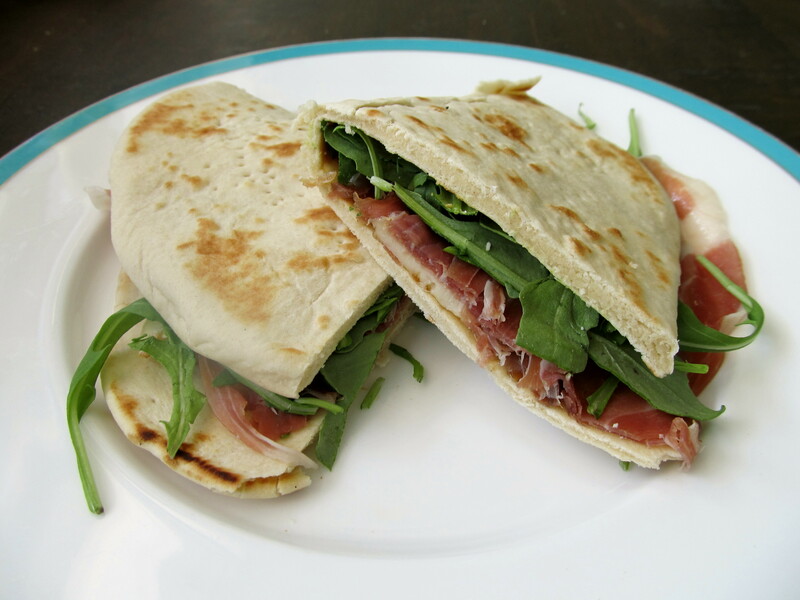 Spread some apple onion chutney on a half, add the cheese, prosciutto, and arugula, then fold over and eat. A little glass of wine and you’re in business. Definitely on our to-do list!